#10 Kelly Lamberti, pictured here against Miami, recorded her 900th dig Saturday night against Eastern Michigan. 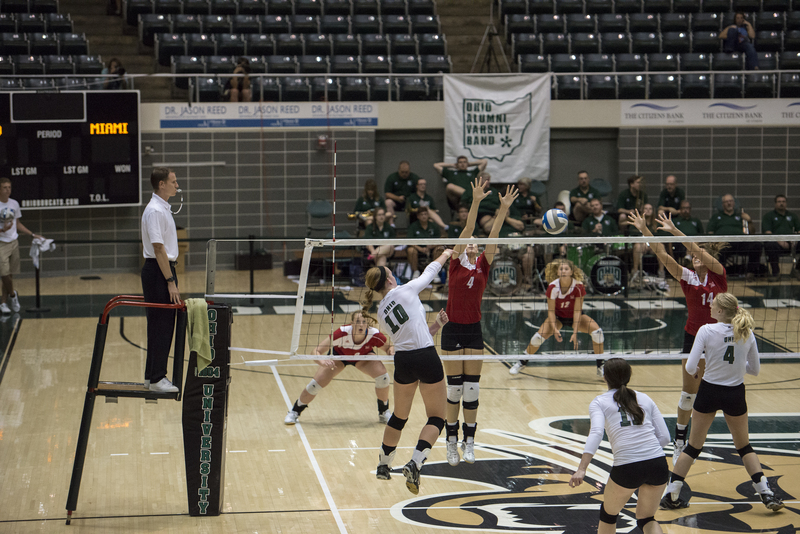 The Ohio Bobcats were able to recover from a slow start against the Eastern Michigan Eagles Saturday, taking control for the rest of the match and winning three sets to one. In the first set, the Bobcats started off slow, falling behind 11-3 and 13-7 at points. However the Cats rallied and were able to cut the Eagles lead to 18-15, forcing an EMU timeout. They were able to keep the run going, tying the game at 21, and eventually completing the first set comeback with a 25-23 victory. Kelly Lamberti had four digs and eight kills in the set. The Bobcats kept the momentum in the second set, opening up to a 7-1 lead over the Eagles. A milestone was also reached during the second set. Lamberti recorded her ninth dig of the match, which gave her 900 digs in her career. She became only the third player in Ohio history to have 900 digs and 1,000 kills in her career. The Bobcats as a team kept the pressure on the Eagles, opening up a wide-open 12-2 lead, something they wouldn’t lose for the rest of the set. They won 25-7 and grabbed a 2-0 lead in the match. Through two sets the Bobcats had 28 kills to the Eagles’ 15, and 48 digs to EMU’s 36. Not only that, but Eastern Michigan’s hitting percentage through two sets was .013. Abby Gilleland had 22 assists and 12 digs through the first two sets. In the third set it was the Eagles who jumped out to an early lead, taking a 6-3 lead over the Cats. They would open that lead to 18-12. The Bobcats didn’t quit however, making a run of their own and cutting the score to 20-17. Still, it wasn’t enough as Eastern Michigan was able to take care of the Bobcats and win 25-21 in the third set. The fourth set saw the Bobcats take back the momentum and open up with huge leads, including 6-0 and 11-4, that EMU would not be able to come back from. The Bobcats won the set 25-14 and won the match three sets to one. The Bobcats outscored the Eagles in kills and digs, recording 58 and 87, respectively. They also had a .260 hitting percentage compared to the Eagles .093 to finish the game. Lamberti finished with 12 kills and 18 digs of her own, and Alexis Pinson and Karin Bull also added 11 kills each. Ohio improved to 15-3 with the victory and 5-1 in MAC play, while EMU 11-10, and 1-5 in the MAC. The Bobcats will come back home for their next match and take on Toledo on October 18th at 7 pm.